Just 33-km northwest of Neuvo Vallarta lies Sayulita. When dusk falls on the beaches of Sayulita Mexico in Riviera Nayarit, you will see silhouettes skim across the water like floating spirits. Watch bodies dive and emerge, facing the sunset while awaiting the next perfect wave. Each evening, these scenes repeat, painted in the dazzling tones of the sun’s descent into the Pacific Ocean. Sayulita surfers are participating in the sport they love, which happens to be one of the main attractions of this traditional Riviera Nayarit fishing village. From all over the world, surfing enthusiasts flock to this Sayulita beach, like a sacred site, with their boards on their backs, their golden skin glistening, and hearts full with a passion for the waves. Sayulita Mexico, which is just up the coast from Litibu Higuera Blanca, breathes a cosmopolitan air. You can hear a young woman speaking German, a young man waxing his surf board while chatting in English, or a small child telling her father what she wants for breakfast in French. This is truly one of Mexico’s more unique Nayarit destinations. There is also a vibe similar to that of the sixties, focused on love and peace, gathering together in nature with a friendly and relaxed environment. Young people, adults, and children come together on these Sayulita beaches where the sounds of drums accompany a pleasant conversation among friends. Come vacation in Sayulita Mexico and take part in a celebration, a great meal, or a calming walk on the beach with Pacific Ocean waves lapping at your feet. If you decide to spend your vacation in Sayulita Mexico, you will have numerous resort hotels and lodging options to choose from. You can stay in sophisticated boutique hotels with whimsical gardens and comfortable rooms equipped with everything you need to achieve genuine rest for mind and body. You’ll also find elegant villas with all the services for a luxurious visit, plus small and colorful hotels and bungalows with family-friendly ambiance. For the more adventurous visitor, there are also campsites on some of the land near the beach, where you can pitch a tent and park RVs. Whether you seek adventure or total resort hotel comfort, Sayulita Mexico has everything you need for an unforgettable vacation. Along the cobblestone streets of Sayulita you will find small businesses and cafes selling delicious traditional dishes. There are many bakeries offering a wide variety of fresh-baked breads that can be enjoyed with an iced tea or a delicious cup of coffee. For something more upscale, there are elegant restaurants set along Sayulita beach, where you can take pleasure in a romantic candlelit dinner. 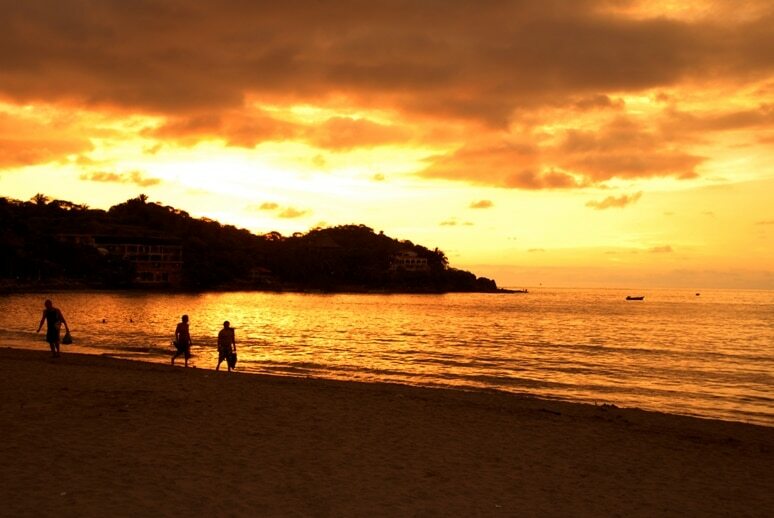 Romance is another essential ingredient of Sayulita Mexico. This is an ideal destination for newlyweds and couples who wish to celebrate their nuptials with the breathtaking beauty of the Pacific Ocean in the background. Art and artisans should not be overlooked in this tremendous Riviera Nayarit town. On your tour throughout the streets of Sayulita Mexico you will find various art galleries and Mexican handicraft shops. Find a souvenir for your return home including beaded costume jewelry, silk rebozo shawls, wool garments, wicker baskets, clay sculptures, and much more. In short, Sayulita Nayarit offers a wonderful sampling of the greatest handicrafts produced in Mexico. End your day having a nice walk along the Pacific Ocean shoreline, as you admire the intrepid surfers awaiting their next big wave.